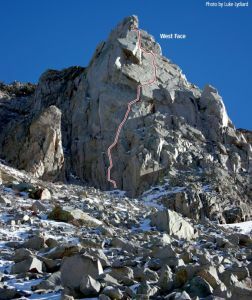 The West Face of Cardinal Pinnacle is a perfect precursor before heading in to climb on the Incredible Hulk. It is similarly clean granite, and the difficulty is close to that of Red Dihedral without the committing length or approach. For the 5.10 crack climber, this is a must-do. Which SuperTopo guidebooks include a topo for West Face?